Your Gateway to the Holidays! 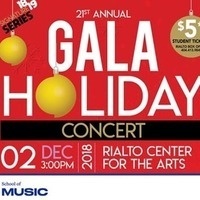 An Atlanta tradition for over 20 years, the annual GSU Gala Holiday Concert brings together over 200 talented student and faculty performers from the School of Music in a joyful celebration of the Holiday Season. With only one performance this year, tickets will be going fast so make plans now to join us. Brimming with cheer, there’s no better way to start off your Holiday celebration!